NANJING, China—Government efforts to tackle a glut of vacant housing in China by spurring home lending have triggered a bigger problem: a surge in risky subprime-style loans that is generating alarm. Home buyers in China normally put down a third of the cost of a new property upfront. But a rapid rise in buyers borrowing for their down payments—an echo of the easy credit that cratered the U.S. housing market and sparked the financial crisis—has led authorities to clamp down. Peer-to-peer lenders, who raise money from investors and then lend it out at higher interest rates, made 924 million yuan ($143 million) in down-payment loans in January, more than three times the amount made in July, according to Shanghai-based consultancy Yingcan. A senior banking executive at one of China’s top four state-owned banks said down-payment loans directly contributed to a recent run-up in housing prices in big cities. “It’s a risky practice that should be contained,” he said. Officials are now stepping on the brakes. The central bank and the housing ministry last month started to crack down on loans that can be used by home-buyers to finance their down payments. To scrape together the 30% down payment for a 1.5 million yuan apartment in Nanjing, Yang Jun, a 31-year-old office worker, borrowed from friends and family but still came up 100,000 yuan, or about $15,300, short. The property developer offered him a loan for the rest. Beijing began easing credit in late 2014 to help cities fill empty apartments—a legacy of a housing-construction boom fueled by a decade of urban population growth and cheap credit. But despite a rise in down-payment loans and lower mortgage barriers for groups such as rural migrant workers, it has proven hard to unleash buying in the right places. 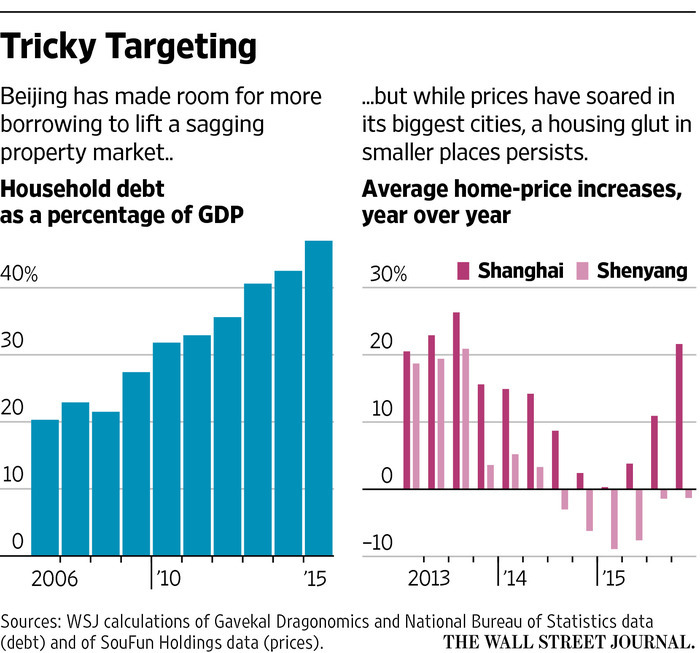 Instead, the easing and incentives fed a property frenzy in China’s megacities. Shenzhen, where housing prices have soared 57% since last year, according to official data, has tightened down-payment requirements. So has Shanghai, where housing loans more than tripled in January from a year earlier. Data on loans used to finance down payments is sketchy, as such financing is a relatively new business. In addition, developers sometimes offer such loans, and banks offer mortgage applicants loans for renovations, taxes or travel that can be channeled toward the down payment, according to property agents. Agents say these loans can attract annual interest rates of up to 24%. Banks and property developers say household leverage is still far from the debt levels in the U.S. that preceded the subprime debacle. Mortgage-default rates are low and buyers who save up for their whole down payment far outnumber those who don’t. Still, amid slower economic growth, some analysts, including at Standard & Poor’s, have warned of growing risks from bad loans tied to the housing market. The health of the property market, which directly and indirectly accounts for nearly a fifth of China’s gross domestic product, is central to the global economy. A property-market slowdown in recent years led to sharp declines in demand and prices for steel and copper, hurting commodity-exporting countries from Zambia to Australia. Some Chinese bankers and analysts say China’s top central banker, Zhou Xiaochuan, helped feed the lending frenzy by signaling in February that there was room for more household debt. Now, a sense of déjà vu is looming over the housing market. “Having encouraged borrowing to help reduce the house glut, the government is now realizing the risks and trying to correct itself,” said China economist Zhu Chaoping at UOB Kay Hian Holdings Ltd. , a Singapore-based brokerage. China Construction Bank Corp. , the largest provider of residential mortgages among Chinese lenders, said the rate of nonperforming loans in residential mortgages in 2015 was 0.31%, up from 0.21% in 2014. The bank’s overall nonperforming-loan ratio reached 1.58% last year. “Down-payment loans are duping young people,” said Jiang Yan, a 32-year-old Shanghai resident, using a term roughly translated as “a greater fool” to describe a spiral of buyers paying irrational prices for assets in the belief they can be sold on for an even crazier price. Yet, authorities are hesitant to endorse a blanket tightening on home buying. Last week, authorities in Jiangsu province ordered commercial banks to tighten mortgage approvals. The instructions indicated that authorities wanted to leave some wiggle room, saying that buyers of second homes could qualify for first-time home-buyer treatment if they have paid off their first homes. In Nanjing, some property brokerages still offer down-payment loans. Property agent Zhou Jingzou said his firm can’t put out outdoor advertising for such loans but will provide down-payment loans for customers on request. Others have stopped. “We are now telling customers, ‘sorry, perhaps you will have to borrow more from friends and family,’” said property saleswoman Zhu Yangyang.